I'm really enjoying the Hasbro Titans Return line so far, and Hardhead is no exception. I don't have enough to really say about him to merit a full review so I'll try to get all my thoughts out here and share a gallery that I hope fills in the blanks. Hardhead is the figure I was most excited for from wave 1 and while I am very satisfied with him I don't think he comes out on the top of the heap. The alt mode looks fantastic and he has a ton of small mounting posts to allow other Titan Masters to hang out on him. The cannon is adjustable and the cockpit opens to accommodate his Titan Master. Transformation is simple and intuitive, with a couple clever tricks that seem new to this type of vehicle to robot conversion. Robot mode is entirely satisfactory. His proportions are good (if you raise his shoulders) and he's got all the major articulation you'd expect with the exception of a waist joint. The paintwork is clean and crisp on my copy and the Titan Master doesn't have any looseness or wobble. I absolutely love his rifle and cannon and the way his shoulder cannon mounts is incredibly well thought out, It doesn't get in the way at all and it can be rearranged to suit almost any pose. The cannon can also be removed and held in his hand if you prefer but it looks a bit too large in my opinion. I wish he had a waist swivel and ankle tilts but given that he's a mainline figure at a low cost of entry I can't really nitpick too much. 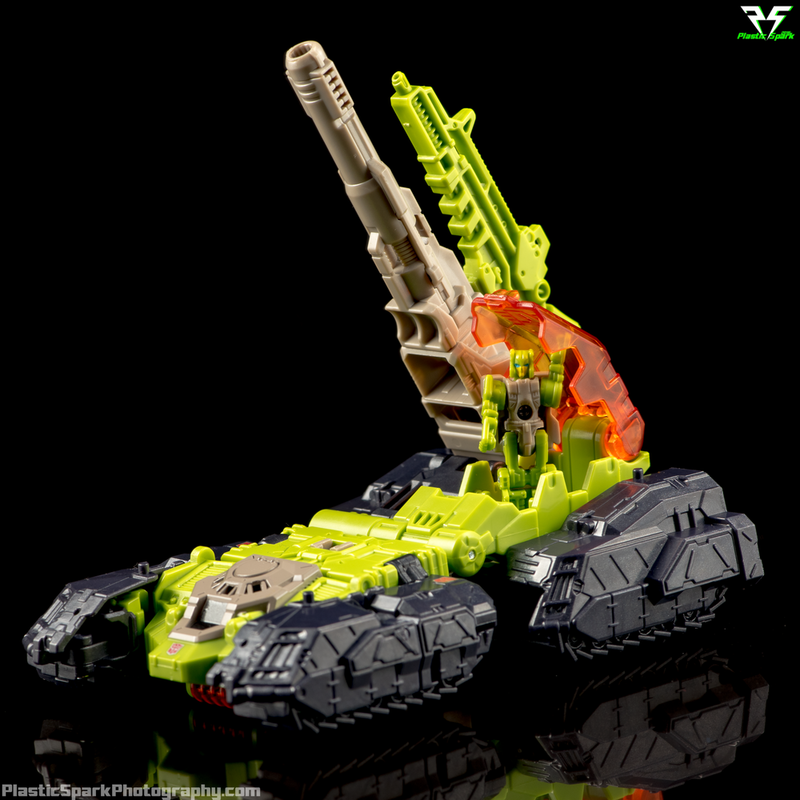 It would also be nice if they included a second rifle similar to his G1 toy. He's a wonderful deluxe size representation of G1 Hardhead and a wholly satisfactory, if possibly unremarkable, Transformers action figure. I am really looking forward to completing the original 7 Headmasters and Hardhead is a wonderful addition to my current Headmasters shelf. Check out the gallery and let me know what you think in the comments section! Any requests for additional photos, comparisons etc can be sent to PlasticSparkPhotography@gmail.com.